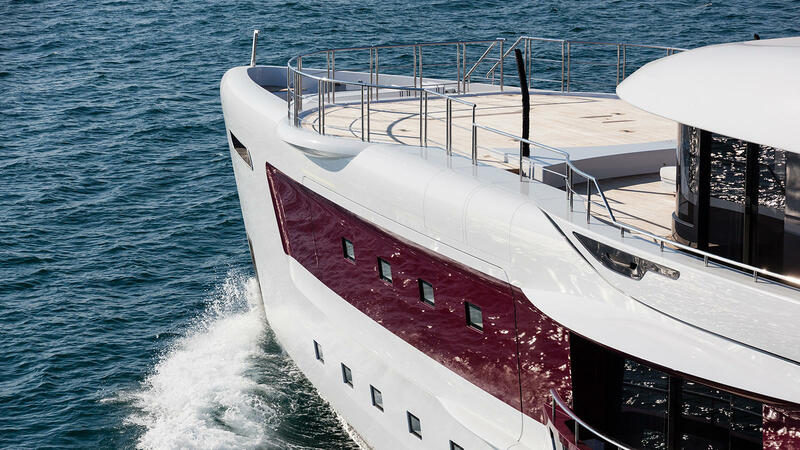 The owners of the first 55 metre Admiral E Motion love Tuscany and its wines, especially a deep ruby Merlot that inspired the shade of their new Quinta Essentia. Swirling the wine in a glass produces tones similar to the accent colour that underlines architectural features on the hull and superstructure. That red-and-cream scheme was also used in their previous Quinta Essentia (now sold and renamed Quite Essential), built at Heesen. This new vessel has more accommodation space than her identical-length predecessor and her interior serves as a showcase for gallery-worthy pieces crafted by master artisans. But her virtues are defined as much by absence as by addition: the new Quinta Essentia, an all-aluminium yacht with exterior styling by Dobroserdov Design, envelops her guests in silence. Imagine 100 people working around Quinta Essentia, saws, sanders, hammers and vacuums humming in unison as her builder readies her for delivery, and then imagine stepping inside and hearing none of it. Silk carpets absorb any footsteps and hefty doors close effortlessly, muffling voices to a barely audible murmur. Take a closer look at Admiral superyacht Quinta Essentia. The owners once again entrusted Sergei Dobroserdov, of Nakhimov Yachts, to manage the project. 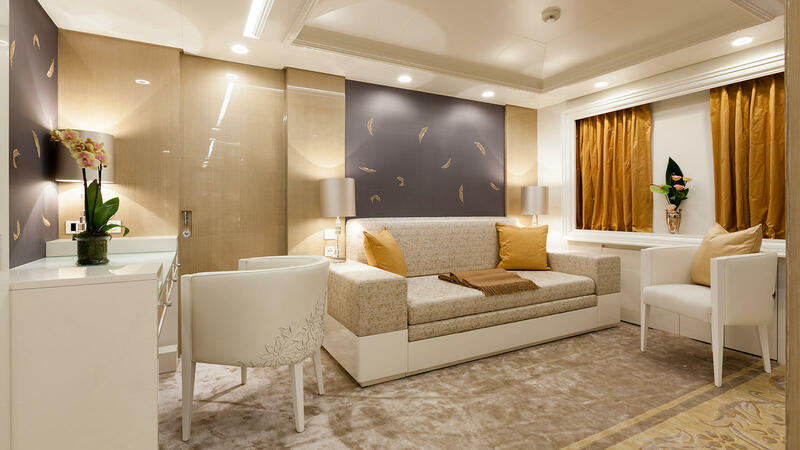 The Monaco-based firm, in turn, asked Dutch sound specialist Van Cappellen to assist the builder, The Italian Sea Group, in minimising noise and vibration on board Quinta Essentia. 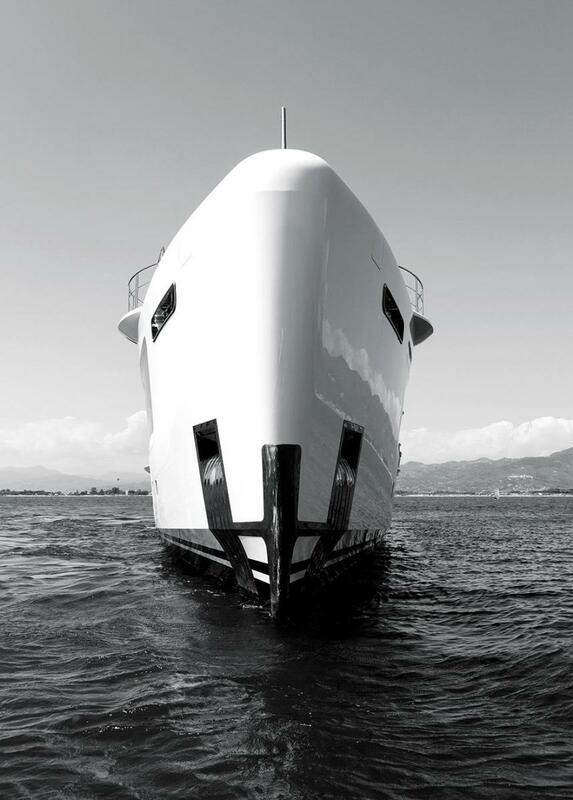 Located in Marina di Carrara, the shipyard has already built some of the quietest motor yachts around. Cacos V, for instance, received the RINA Comfort Class designation. Quinta Essentia, the first of a new series called E Motion, is virtually silent underway when she cruises using only her two Auxilia electric motors, drawing power from variable-speed generators by Volvo. The yacht’s hybrid propulsion system consists of two generators and two electric motors, connected to the propeller shafts and to the boat’s two MAN diesel engines via a clutch. 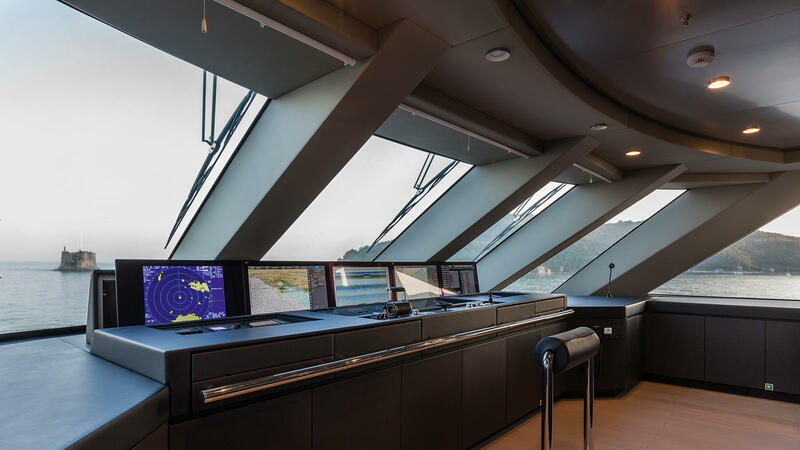 The compact engine room, situated amidships on Quinta Essentia, was an important aspect of the new build, says Albert Abma, manager of Vripack’s naval architecture department. The Dutch engineering company worked with Nakhimov and The Italian Sea Group to develop this hull shape for the new Admiral E Motion series. It was tank tested at the Maritime Research Institute Netherlands to ensure it met performance, efficiency and comfort goals. Keeping the engine room relatively small allowed the living space to be maximised. “For a 55 metre, she has enormous volume,” says Abma. Although identical in length to the owner’s previous boat, the new Quinta Essentia boasts greater volume — 873 gross tonnes, versus 781. This translates into six spacious guest cabins, including a palatial master suite, as well as large upper and main deck saloons, with plenty of room still for Quinta Essentia’s wellness area, a garage for an eight metre tender, two spa pools, crew cabins built to spacious LY3 standards and a superyacht helipad that will serve most often as a recreation deck. Perhaps an even better way to assess Quinta Essentia’s attributes is her high transport-efficiency rating, says Abma. Usually used in shipping to determine the greatest tonnage you can transport with the least fuel, transport efficiency may not be alluring and it seldom comes up as a topic in yacht features. But it is interesting to measure this yacht’s gross tonnage in relation to fuel consumption. 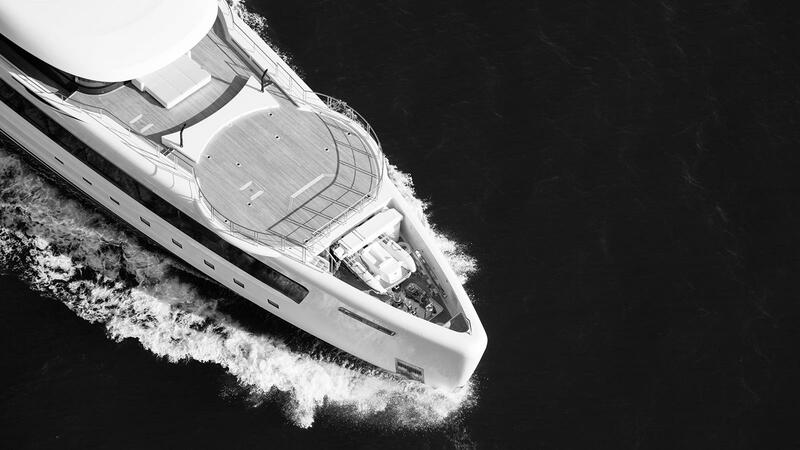 Quinta Essentia’s high rating simply means that her luxurious dimensions don’t come at the expense of her energy use. She is big and fuel-efficient; if she were a car, she’d be something like the hybrid Hummer, only much prettier and, relatively speaking, faster. With a top speed of 16.4 knots and cruising speed of 15.2 knots (under diesel power), she isn’t sluggish. Among the owners’ other priorities were low resistance, comfort and a shallow draught: Quinta Essentia’s owner enjoys following sailing regattas that often take place around islands and close to the coast. Achieving all these goals required ingenuity. Yes, lightweight aluminium is best to achieve a shallow draught, but it also further limits space below the waterline because the construction method uses frames that interlock and don’t allow for much room down there. 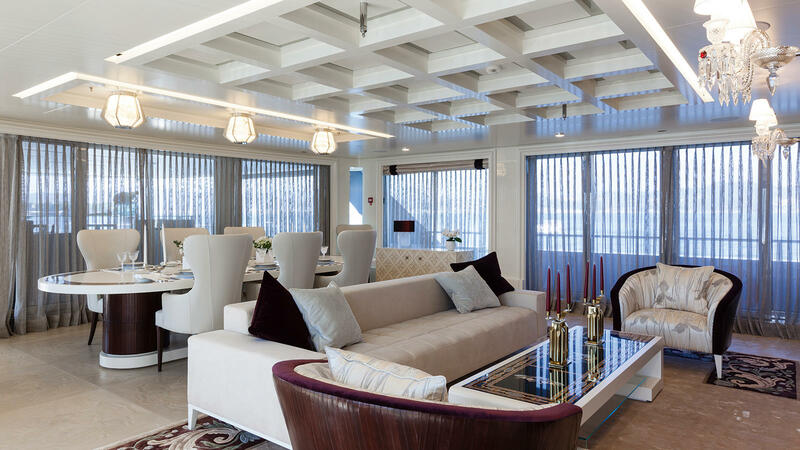 This means the designers and the builder had to be pretty creative to accommodate all technical spaces without taking away from the guest and crew areas on board Quinta Essentia. This challenge was compounded by the owners’ desire to feel connected to the environment. 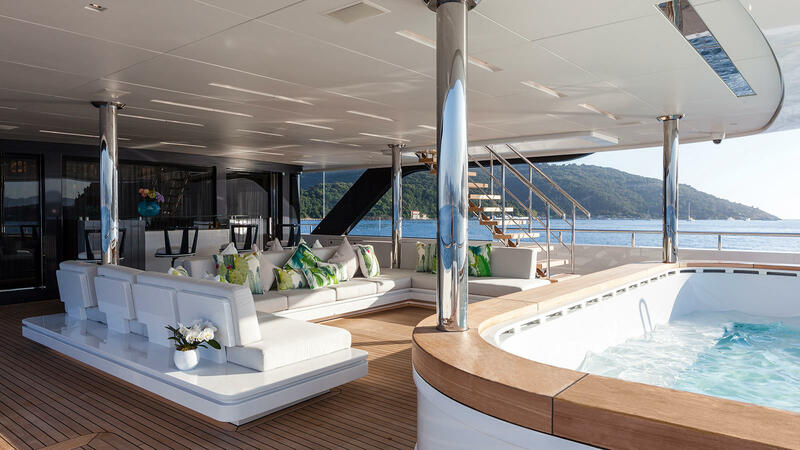 The master suite, on Quinta Essentia’s main deck, has a superyacht balcony with sliding doors that the owners can operate on their own (a feature that again restricts the available technical space). Aluminium, for all its virtues, tends to transmit noise and vibration, which explains the special attention the yard and project managers gave to both. Of course, pushing the envelope can be fun for naval architects and designers. “The owners are very knowledgeable and experienced; they gave a clear profile, so it was a fun project,” says Abma. Interior designer Michela Reverberi echoes the sentiment but also notes that executing the vision they’d created together was a practical challenge. 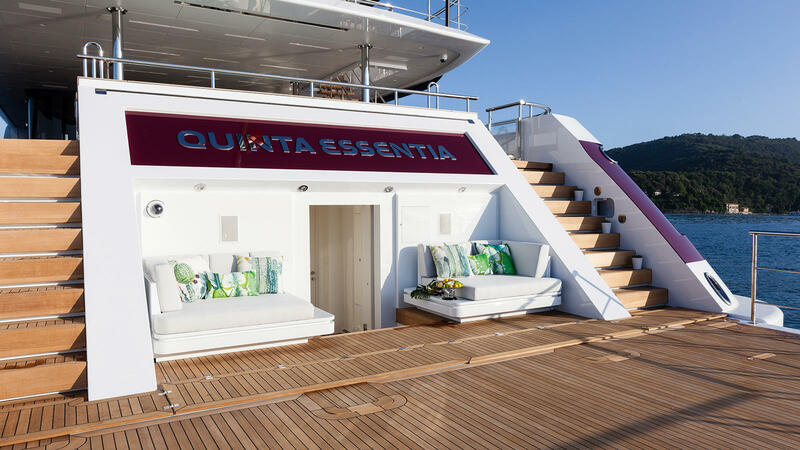 Not one of the custom pieces on board Quinta Essentia comes from a shop — or even a single artisan. The dining table, for instance, combines the talents of a master stone carver, carpenter and upholsterer. 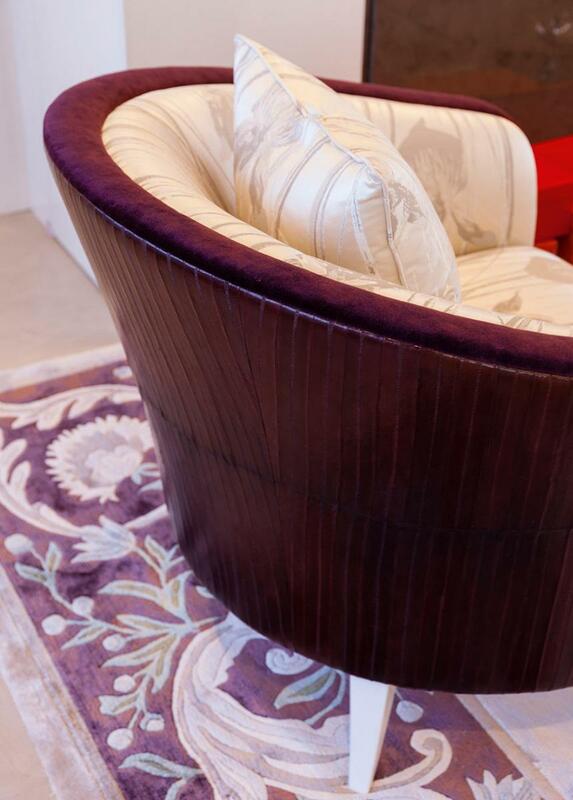 The sofas, covered in velvet, have backs in carved leather, the work of London-based artist Helen Amy Murray. The superyacht staircase that connects the three main levels features a stunning mural in metal resin with enamel and real feather inlays by Based Upon, of London, and engraved clear glass by Bernard Pictet, of Paris. “I had suggested one or the other, but they loved them both,” says Reverberi. 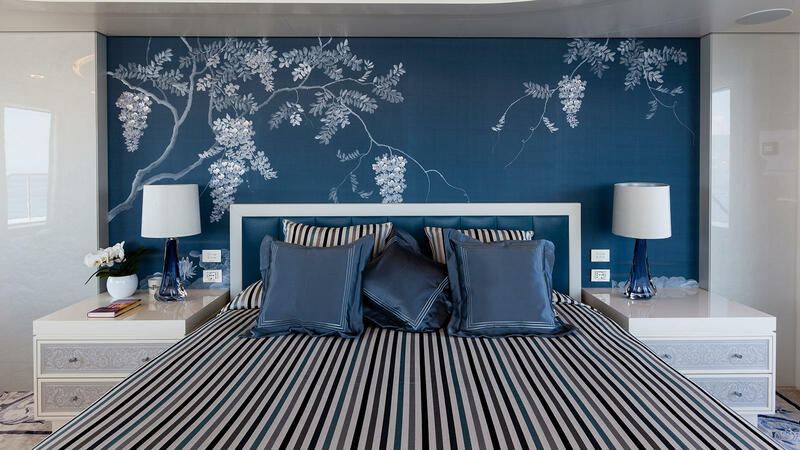 The trick was to balance them out so they would play off each other, a task reprised in every room on Quinta Essentia with the design of the hand-knotted silk carpet echoing hand-painted garlands on the ceiling. The owners love creating and building and are very involved in their yacht projects, each focusing on different aspects. He likes the technology and machinery, she loves interior design, says Reverberi, who worked with them on the previous Quinta Essentia. The name is an important clue to the interior design. 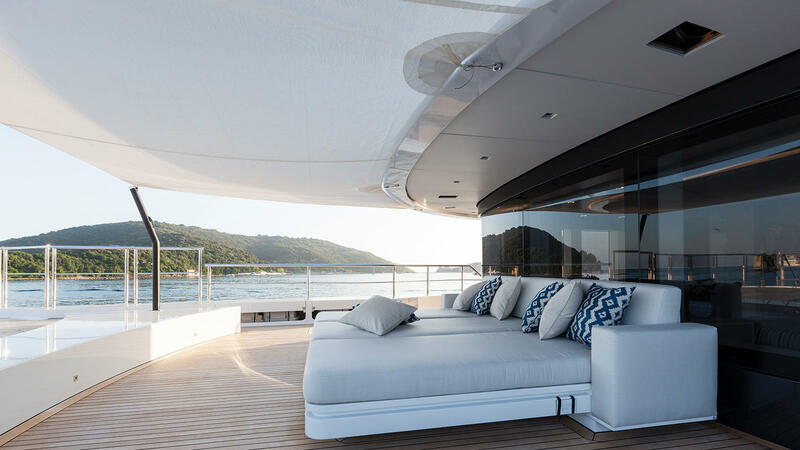 Quinta Essentia’s owners wanted to represent the four elements considered in western culture as the essence of life — air, fire, earth and water — and use them as “building blocks” for the fifth element, the family’s yacht. The idea underlines the décor of the new Quinta Essentia — but they also asked Reverberi to represent their love of Tuscany, its culture and countryside and their own olive orchard and vineyard. So, the colours of wine and olives join motifs of grapes, leaves and trees. “I studied how to do the themes that are characteristic of that area, such as embossed leather, scagliola [a stucco used to create imitation stone] and inlaid marble, but to do it in a more contemporary way,” says the designer. Instead of embossed leather, for instance, she decided to work with engraved leather for a more graphic effect. While crown mouldings and stucco details are used in places, she also commissioned artists to paint fresco details on the ceiling. Quinta Essentia’s floors are made of woods repurposed from old palaces and rearranged in a sort of mosaic according to a pattern by Italian studio I Vassalletti. Her interpretation of the owners’ wishes is, at times, poetic. On Quinta Essentia’s lower deck, enamel birds “fluttering” on the corridor’s wall show the way to four cabins decorated according to the four elements. The red birds point to the “fire” cabin. An outstanding feature in each of these rooms is the embroidered silk-on-paper made by London and New York-based specialist Fromental, beautifully illustrating the theme. Not to be overlooked are wooden walls painted to mimic linen. Quinta Essentia’s owners had seen something like it in a luxury shop and asked Reverberi to replicate the effect. “We did hundreds of samples to create this effect of fabric. The patterns of fibre are silver on white for general spaces, with silver on blue for the water cabin, gold on beige for the air cabin and black on burgundy for the fire cabin,” she explains. Flowers are another of the owners’ interests, so there are plenty on board. 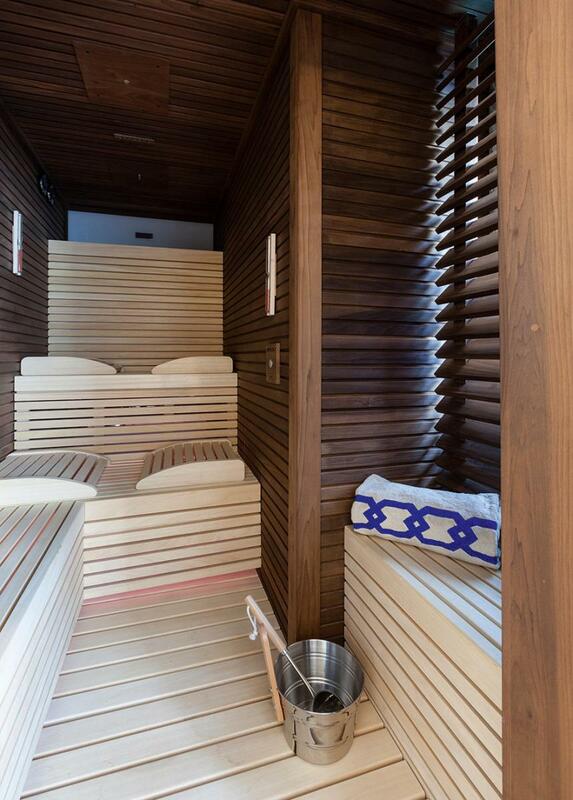 The most outstanding example is found in Quinta Essentia’s superyacht spa. This spectacular wellness centre on the lower deck includes a massage room, sauna, shower room, toilet, a lounge and a superyacht beach club. 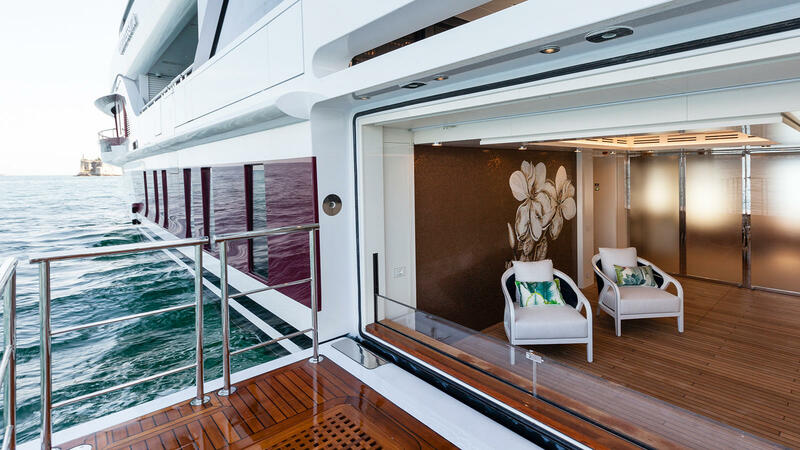 The transom unfolds to form a teak-laid platform accessible through a door from the spa, and there’s a fold-out balcony to port, too. The stand-out decorative feature here is the wall mosaic of a huge white flower against a copper-coloured background, by Sicis. “From a certain point of view, Quinta Essentia is a very feminine boat,” says Reverberi. “But the boat is planned to be easily simplified. 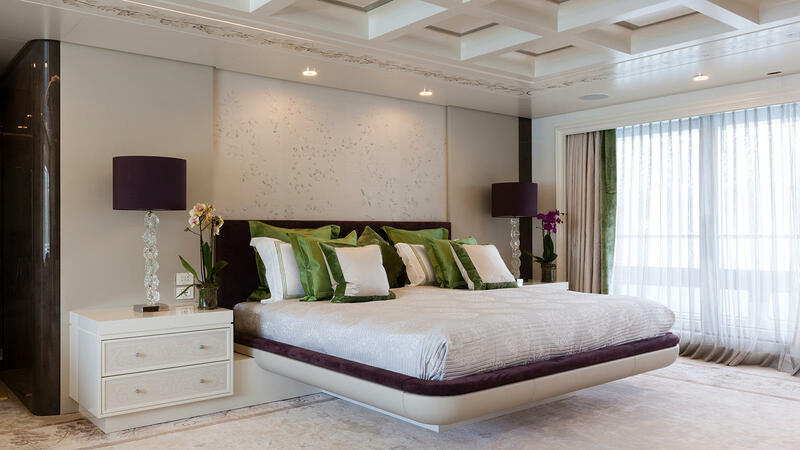 All these elements, like the wallpapers or the carpet, can be changed into something more masculine without changing the structure of the boat, without touching the main characteristics. They are just some elements that give sweetness, some softness to the boat in order to follow the owners’ desire,” she says. And that is part of the appeal. 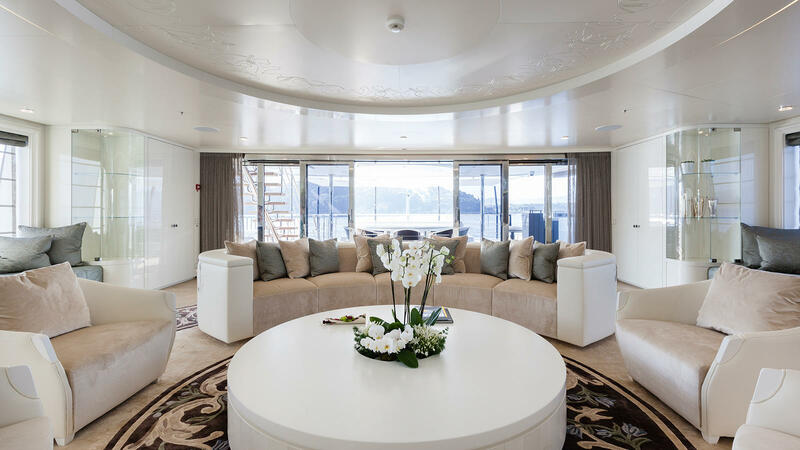 “The whole interior makes you feel peaceful, probably because of the colours,” says Claudio Corvino, a naval architect who works in the sales department of The Italian Sea Group. That’s wonderful for guests on board Quinta Essentia. Loving the build process as they do, Quinta Essentia’s owners are already setting their sights on the next project. It seems that, just like Tuscany, yachting is a lifelong romance for them.